CANINE CRUSADERS Dog owners say the National Park Service is planning to unfairly exclude their pets from regional park trails. Prancing poodles, sociable golden retrievers and pooches of indiscernible lineage were among the some 1,000 dogs shepherded by their people across the promenade at San Francisco's Crissy Field during the Mighty Mutt March on a sunny Saturday last month. Though the canines acted carefree during the procession, their angry guardians had gathered to protest the Proposed Rule for Dog Management, aimed at keeping them on a tighter leash in the Golden Gate National Recreation Area (GGNRA). 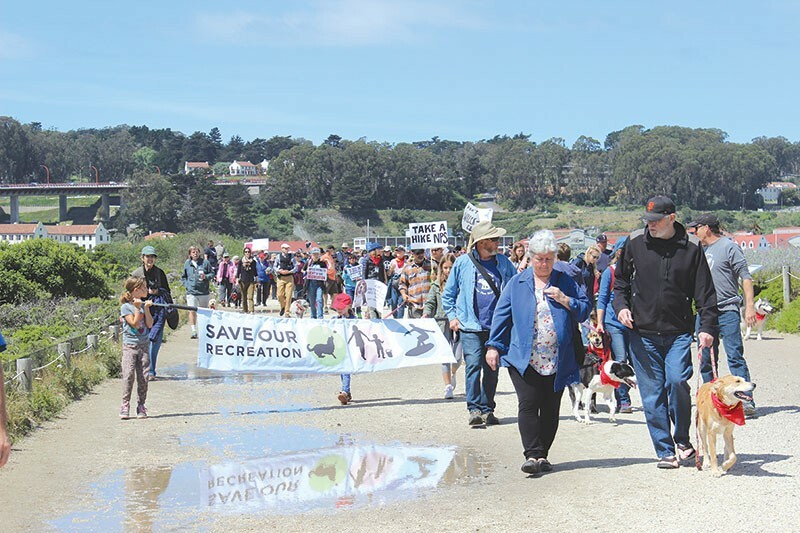 Marchers yelped that over the last 14 years, the National Park Service (NPS), which manages the GGNRA, has brandished a big stick and presented plan after plan to greatly decrease areas that allow recreational dog walking, both on- and off-leash. According to officials, there are environmental concerns, as well as a rise in complaints about unruly canines. They also say that they need to balance the needs of multiple users that include tourists, hikers, equestrians and mountain bikers. Though the NPS has walked away from previous negotiations and dropped other iterations of the plan, the agency may finally make good on its threats. It now appears poised to usher in the latest and most restrictive version of its dog-management plan, despite loud opposition. The new plan restricts off-leash dog walking to seven areas and on-leash to 15 areas, distributed across the entire GGNRA—an 80,000-acre park that spans across Marin, San Mateo and San Francisco counties. Dogs are currently permitted on less than 1 percent of the land, and the proposed rules would slash off-leash dog walking by 90 percent and on-leash dog areas by 50 percent. In Marin County, that equates to about eight miles of land, with Rodeo Beach serving as the only location for off-leash dog walking. Dogs will be banned from areas that they currently frequent, including the South Rodeo Beach Trail, the Oakwood Valley Trail, the Miwok Trail and the Coastal Trail. The Muir Beach neighborhood, totally surrounded by the ocean and GGNRA, is especially hard hit, with dogs allowed on-leash on the beach, but banned on the surrounding trails. "They made a unilateral decision that doesn't answer to the will of the local people that use the Golden Gate National Recreation Area," says Mill Valley's Michael Barti, who attended both the meeting and the Mighty Mutt March. "They're obviously not listening to anyone." That cry of fait accompli has been bandied about by dog advocates since the plan was unveiled in late February. Christine Lehnertz, superintendent of the GGNRA, disputed this claim at the public meeting. "A decision has not been made and our effort to hear from the public is genuine," she said. Listen she did. Among those who spoke at the meeting was a man living near the Alta Fire Road in north Sausalito. "Unfortunately, I've been attacked and bitten by an off-leash dog, and my wife is too scared to walk our kids on fire roads," he said. "So I really to thank you for trying to protect us." Lehnertz and her staff will soon be inundated with opinions of opponents and proponents, as the public comment period—required by federal law—ended on May 25. When this article went to print, nearly 2,800 comments had been received. The GGNRA claims that it developed the new rules to meet the mandates of the NPS to preserve and protect natural and cultural resources for future generations and to better accommodate a variety of visitor experiences, among other reasons. That's a tall order, considering that between 11 and 18 million people visited the GGNRA last year, depending on which official you ask. Opponents of the plan pooh-pooh the reasons for it, claiming that the GGNRA is overreaching by throwing invalid issues into the mix—such as the potential decline of endangered and threatened plant and wildlife species, because the NPS has not conducted studies within the GGNRA to prove it. Instead, it has relied on peer-reviewed studies that critics say have nothing to do with the GGNRA. Opponents also maintain that with more than 99 percent of the GGNRA off-limits to dogs, the majority of space is left for a dog-free park experience. Additionally, most tourists visiting the GGNRA take in the sights at Muir Woods, Alcatraz and other high-profile areas that the NPS advertises in travel magazines. These visitors are not typically found on the Alta Fire Road above Marin City or the Oakwood Valley Fire Road in Tam Valley—places where dogs currently play off-leash. "This is important to us, because there aren't that many places where you can walk your dogs off-leash, and we hate to lose it," says Corte Madera's Candy Lee, who regularly walks her dog with a group of friends at Crissy Field. "What will we do? Stay at home with our dogs?" With land in Marin, San Francisco and San Mateo counties affected, groups opposing the plan have emerged in all three counties and several forged an alliance under the nonprofit umbrella organization Save Our Recreation. Marin County DOG (Dog Owner's Group) is a supporting member and touts its mission as promoting responsible dog walking and advocating for dog-friendly trails and beaches in the county. "The GGNRA has ignored the fact that the public has overwhelmingly opposed the dog-management plan," says Cassandra Fimrite of Mill Valley. "That's why I sought out other people that felt the same way." Fimrite joined forces with Laura Pandapas, an outspoken activist from Muir Beach, to found Marin County DOG. Pandapas said that the GGNRA general management plan, which was signed into effect in January 2015, is also at play. "That plan transforms our recreation area into a wilderness area with 90 percent of the GGNRA reclassified as a 'natural zone,'" she says. She believes that reduced visitation is an unspoken GGNRA goal that could be achieved by instituting policies that restrict access, made possible by the natural zone designation. In fact, she thinks that the tail may be wagging the dog in this case, because the NPS is broke and the vast majority of improvement projects in the GGNRA rely on donations from the Golden Gate National Parks Conservancy, a private, nonprofit fundraising partner for the GGNRA with a board of trustees that reads like a who's who in the Bay area. Since the Conservancy's inception in 1981, it has raised close to $400 million for the GGNRA. The improvements to Crissy Field were funded primarily by donations from the Haas family through the conservancy. Much to the chagrin of dog advocates and those who loathe the idea of privatizing funding for the GGNRA, none of the conservancy's money goes for maintenance. Yet with every improvement made, every visitor center built and every fancy plaque installed to honor a large contributor, maintenance costs increase significantly. The GGNRA is on the hook to pay for those expenses, because, as National Parks Conservancy spokesperson David Shaw admits, it's not glamorous for donors to sponsor cleaning bathrooms or taking out the trash. Appropriations from Congress aren't substantial enough to cover those costs. In fact, the GGNRA currently has a maintenance backlog of more than $278 million, and conservationists fear that the conservancy contributions will dry up appropriations from Congress and leave the national park system vulnerable to the whims of donors, both private and corporate. Last month, Jon Jarvis, National Park Service director, disclosed a plan that allows NPS directors and deputy directors to solicit donations, a practice that had been banned. Pandapas is concerned that the GGNRA can cut overhead with the new "natural zone" designation by excluding major user groups, starting with people walking their dogs. In that way, they could continue expanding and improving the park in areas chosen by the conservancy's board of trustees. "It's farfetched," said David Shaw, who points out that the GGNRA sets the priorities and the Conservancy follows. GGNRA spokesperson Howard Levitt concurs. "That idea is floated by the flat earth society." Regardless, Pandapas and the dog activists soldier on. They claim that they're not a fringe group, and they may be right. The Marin Humane Society estimates that 40 percent of the county's households have at least one dog, and dog advocates have garnered support from boards of supervisors in Marin, San Francisco and San Mateo counties. Dog-walking devotees trust that the GGNRA's undoing will be its failure to provide scientific proof of the claim that dogs have negative effects within urban recreation areas, and they're trying to obtain documents from the GGNRA to substantiate their assertion. A lawsuit filed by Bay Area dog and recreation groups is pending against the National Park Service over its refusal to comply with document requests under the Freedom of Information Act. The NPS hopes to make a decision at the end of the year and implement its final plan in early 2017.